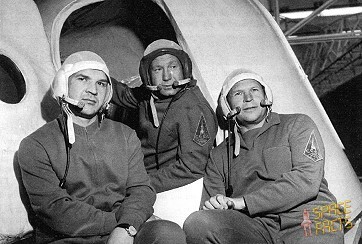 In the early hours of 30 June 1971, the Soviet Union prepared to welcome its three latest cosmonaut heroes back to Earth after a record-breaking space mission. Not only had the Soyuz 11 team—Georgi Dobrovolski, Vladislav Volkov, and Viktor Patsayev—spent more than 23 days in orbit, but they had also successfully occupied the world’s first true space station. It was a fitting response to the U.S. achievement of placing a man on the Moon. As the commander of one of the recovery helicopters spotted the parachute of Soyuz 11’s descent module, it was a glorious sight. The helicopters touched down and the would-be rescuers made their way cheerfully to the spacecraft, still superheated and charred from reentry. They could not have anticipated the horror that they would find inside. 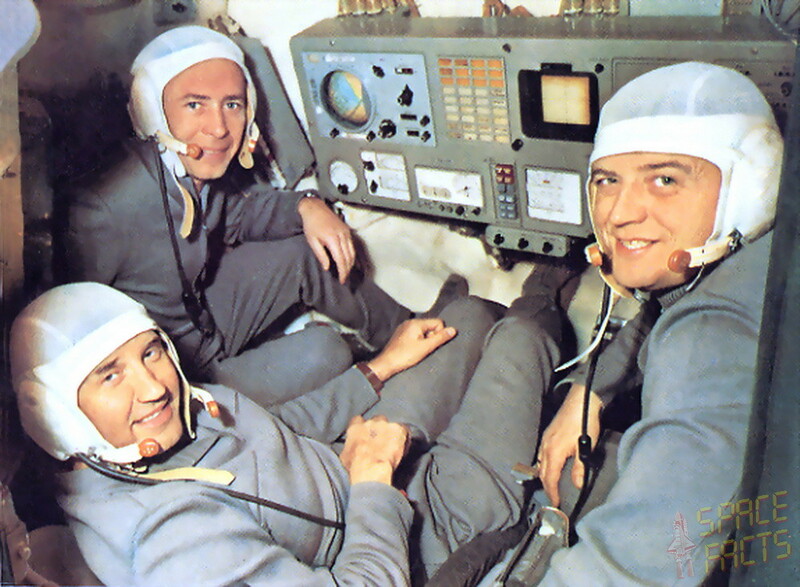 The tragic crew of Soyuz 11 – Georgi Dobrovolski (left), Vladislav Volkov (right) and Viktor Patsayev (background) – should be remembered as the first men to occupy a true space station and the men who established an empirical space endurance record of more than 23 days. Their legacy is that they laid the foundation for the space stations which would follow (Credits: Joachim Becker/SpaceFacts). Soyuz 11’s touchdown was wholly automatic, from the parachute deployment to the firing of solid-fueled soft-landing rockets in the base of the descent module. It was 2:16 a.m. Moscow Time when the vehicle came to terra firma. The three cosmonauts had broken the previous space endurance record of 18 days, set by another Soyuz crew in 1970, and had almost doubled the U.S. Gemini 7 record. And for three weeks, Russia had been abuzz with the names of Dobrovolski, Volkov, and Patsayev: the cosmonauts had their own slot on Moscow television, young girls had turned Volkov into a teen idol and pin-up star, and their landing was accompanied by a carnival atmosphere. No one could have been more shocked than Nikolai Kamanin, the commander of the cosmonaut team, and veteran cosmonaut Alexei Yeliseyev, who waited more than an hour for news of a successful recovery … but were greeted with news of catastrophe, in the form of three numbers: 1-1-1. Those numbers spoke of something inescapably tragic … the entire crew was dead. – A dramatic reenactment of the last moments of life of the Soyuz 11 crew in a video by filmmaker Vaughn Juares. A system of five numbers, Yeliseyev later explained, ran from 5 down to 1 to explain a cosmonauts’ health: these denoted that he was in excellent condition (5), that he was in good condition (4), that he had suffered injuries (3), that the injuries were of a severe nature (2), and that they were fatal (1). There was one number for each member of the crew. The triple “1″ meant all three were dead. Immediately, Yeliseyev, Kamanin, and veteran cosmonaut Vladimir Shatalov were flown directly to the landing site in Kazakhstan to see for themselves what nobody could quite believe was true. – Below, a particularly harrowing video of rescuers offer initial support to the bearded Georgi Dobrovolski. Little did they know at the time that all three men had been dead for far too long for resuscitation to have any positive effect. By the time Shatalov and Yeliseyev arrived, the bodies had already been removed from the landing site. As he stood out there on the barren steppe, Yeliseyev—the man who had spoken to them so often over the past three weeks—was struck and driven to tears by the absurdity of it all: a picture-perfect landing, a descent module in good shape, an outstanding mission, excellent weather, a flat field … “and the guys are dead.” Like many others, he blamed himself. Had the hermetic hatch sealed properly after undocking? The original Soyuz 11—from the left, Valeri Kubasov, Alexei Leonov, and Pyotr Kolodin—were grounded shortly before launch by an unfortunate medical misdiagnosis (Credita: Joachim Becker/SpaceFacts). Also wondering if he could have done more was Alexei Leonov, the man who might have been in Dobrovolski’s position. In his memoir, Two Sides of the Moon, Leonov noted that he had advised the Soyuz 11 crew to close a series of air vents between the descent and orbital modules and to reopen them when the parachutes deployed. “Although this deviated from the flight regulations,” he wrote, “I had trained for a long time for the mission they were flying and in my opinion this was the safest procedure. According to the flight program the vents were supposed to close and then open automatically once the parachute had deployed after re-entry. But I believed there was a danger, if this automatic procedure was followed, that the vents might open prematurely at too high an altitude and the spacecraft depressurize.” Sadly, the cosmonauts did not take Leonov’s advice, choosing instead to follow their own training. In the United States, the response was equally shocking, but for different reasons. Since the summer of 1969, Tom Stafford had been chief of NASA’s astronaut corps, and among his duties he had helped to supervise the direction that the manned spaceflight effort would take after the Apollo lunar landings. America was expecting to launch Skylab, a large orbital station of its own, in 1973. Crews of three men would spend between one and two full months aboard this outpost, performing a variety of scientific and biomedical studies in weightlessness. At the time of Soyuz 11, Stafford was visiting Europe with his wife and daughters and was due to make an appearance at the International Aeronautical Federation Conference in Belgrade. “Before I reached Belgrade,” he wrote, “I heard the news that the … cosmonauts had died on their return to Earth. My first worry was that the stress of a long-duration flight had killed them and wondered what that would mean to our Skylab crews. Clearly we needed to know more than what was in the news.” Back in Houston, Deke Slayton was of the same opinion: a year before, Nikolayev and Sevastyanov could hardly stand after their 18-day mission, and now Dobrovolski, Volkov, and Patsayev had returned dead from orbit after 24 days. “Was there something about being weightless that long that could kill you?” Slayton wondered in his autobiography, Deke. The lavish funerals of the Soyuz 11 crew highlighted the enormous sense of loss felt by the Soviet people. The three men had become national, and international, heroes (Credits: Joachim Becker/SpaceFacts). 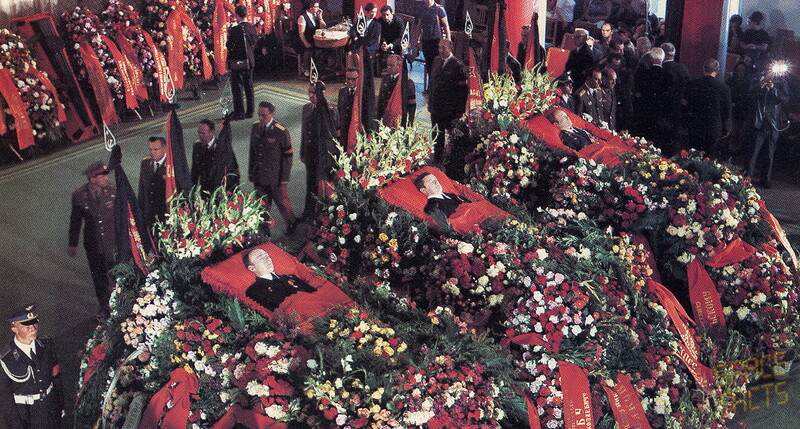 A day or so after the space disaster, their bodies were laid in state in the Central House of the Soviet Army, each clad in a civilian suit and each resplendent with the gold stars of a Hero of the Soviet Union. Only Patsayev’s body showed visible evidence of the trauma he had endured: a dark-blue mark, similar to a large bruise, covered most of his right cheek. Tens of thousands of grief-stricken Muscovites, together with the cosmonauts’ families and an emotional Leonid Brezhnev, who covered his face with his hand at one stage, filed past the open coffins to pay their final respects. At around this time, Tom Stafford received word from Malcolm Toon, the U.S. ambassador to the Soviet Union, that he was to represent President Richard Nixon at the funerals. Four years earlier, Lyndon Johnson’s administration had offered to send an astronaut to Vladimir Komarov’s funeral, but this overture had been rejected on the grounds that it was a “private” affair. Now, relations between the two spacefaring nations seemed somewhat more cordial and, upon his arrival in Moscow, Stafford travelled in the limousine of cosmonaut Georgi Beregovoi directly to the funeral … and even acted as one of the pallbearers for the massive urns which carried the cosmonauts’ ashes for interment in the Kremlin Wall. Alongside the three-man crew of the Osoaviakhim-1 balloon, who had plunged to their deaths in 1934 after setting a new altitude record, Dobrovolski, Volkov, and Patsayev represent one of only two “group burials” ever to have taken place in the Kremlin necropolis. By the time of the funeral, it was becoming increasingly clear that the deaths of the cosmonauts were due to a mechanical problem within their spacecraft and had nothing to do with their individual physiological states or their prolonged exposure to weightlessness. Initially, NASA physician Chuck Berry was so sure that nothing physiological could be to blame that he pointed to the release of a toxic substance inside the descent module as one possible cause. Decompression and its effects seemed the most reasonable explanation, and this was verified by the post-mortem examinations of the cosmonauts. One of the bitterest ironies is that if Dobrovolski, Volkov, and Patsayev had been provided with space suits, they would have survived. This became clear when the State Commission, chaired by Mstislav Keldysh, wrote its report a few weeks later. Ten subcommittees were established to investigate every aspect of the Soyuz which could have contributed to the disaster, although physicians had judged almost immediately after finding the bodies that the most likely cause of death was decompression. Specialists from Moscow who arrived at the landing site on 1 July verified that there were no cracks or holes in the hull of the descent module. Decompression could have been caused by either the premature opening of one of two valves at the top of the descent module or a leakage from the hatch. When Chief Designer Vasili Mishin testified before Keldysh’s panel on 7 July, he presented diagrams which seemed to endorse the first of these possibilities. It seemed unlikely that an incorrect command had caused the valve to prematurely open, because both valves operated from thesame circuit. When one considers the thickness of the valve tube, the volume of the descent module itself, and the fact that the air would have escaped at the speed of sound, it is easy to see how the cabin pressure could have diminished nearly to zero and killed the crew in under a minute. The positions of the bodies in the descent module suggested that Dobrovolski and Patsayev had tried to unstrap in order to close the valve, but had been unable to act quickly enough. At the instant of separation of the orbital and instrument modules, the cosmonauts’ pulse rates varied broadly: from 78-85 in Dobrovolski’s case to 92-106 for Patsayev and 120 for Volkov. A few seconds later, when they first became aware of the leak, their pulse rates shot up dramatically—Dobrovolski’s to 114, Volkov’s to 180—and thereafter the end had been swift. Fifty seconds after the separation of the two modules, Patsayev’s pulse had dropped to 42, indicative of someone suffering oxygen starvation, and by 110 seconds all three men’s hearts had stopped. Not until October 1973—more than two years later—would the Western media, in the form of the Washington Post, finally be made aware of the fact that the valve was to blame. In the meantime, by early August 1971, when Keldysh’s report was completed, a number of recommendations were made for future missions. Firstly, the valve needed to be more stable with regard to shock loads. Secondly, there needed to be quick-action chokes to shut the valves manually in a matter of seconds. Finally, and of pivotal importance, space suits were to be worn for all phases of a mission in which depressurisation was a possibility. Testimony to the success of the Sokol is that, since 1971, no other cosmonaut has lost his or her life through the decompression of their spacecraft. Nor was this simply a knee-jerk reaction: the Apollo 15 “re-evaluation” encompassed reviewing the design and testing of windows, hatches, valves, fittings, and wiring in both the lunar and command modules. “In addition,” the release continued, “studies were performed on re-entry effects on crew and cabin with a completely failed window, structural loading during lunar module jettison, cabin pressure decay caused by various-sized holes, suit-donning times, and post-landing emergencies.” Although the results established a high level of confidence in the Apollo hardware, this re-evaluation is notable in that the calamity of Soyuz 11 shook to the core not only the Soviet manned space program, but also that of the United States. – By Ben Evans. This article was originally published in AmericaSpace. It is republished with permission of the author and editor. Be sure to check out Mr. Evans’ prequel to this story, The Crew That Never Flew: The Misfortunes of Soyuz 11.